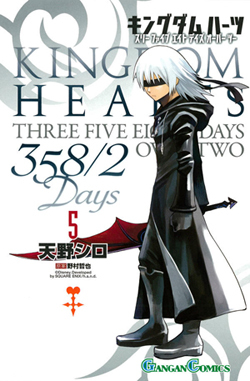 KH 358/2 Days Volume 5 Cover! In the midst of all the exciting news, one can not forget Kingdom Hearts! 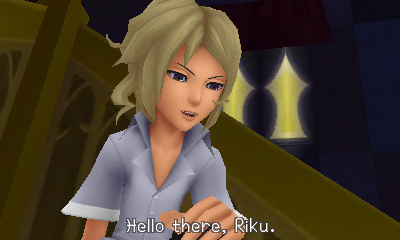 And how could anyone forget about Kingdom Hearts 358/2 Days. Thanks to our good friends aibo_ac7, the official cover of Volume 5 of the Kingdom Hearts 358/2 Days manga has been released. Take a look below! How very mysterious indeed. Not to mention fitting, as this is the final Volume in the Days manga selection. Riku, stop hunching over you'll get a hump in your back. Half of the KH cast shop at the same shoe store apparently. One of the lulzier things about BbS was that Ansem the Wise and his five (at the time) apprentices were already wearing Org. boots. I guess MX owned a haberdashery in secret and after many years that's how he got the funding for that swanky castle that Xemnas owned. Did you perhaps miss the point of why he cut it in the first place? Please no. His hair looks great short. His long hair was a mess, covered his eyes, and we already have a ton of long haired silver haired males in SE games. Him growing and cutting his hair was symbolic of the long journey and new beginning he had.